Does it bother you when you have to wash out your mask brush (or clean your nails) after you've applied a mask? For me, it's a personal pet peeve, so I was very excited to try the e.l.f. Pore Refining Brush and Mask Tool. The blue end (shown, above) has etched in line details that look like a brush, but it's a soft, flexible spatula. To apply a cream, bubble or gel mask, I turned the spatula on it's side, scooped out the mask and painted it on my skin in thin layers. Once I was done, all I had to do was rinse it off, pat it dry and I was done! 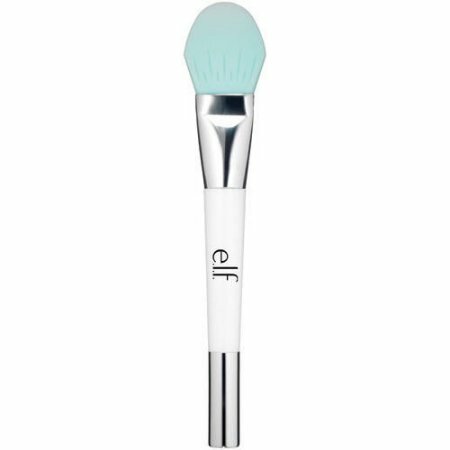 The other end of the brush has stiff white compact brush hairs, which you can use to exfoliate around the nose or t zone before rinsing the mask off. Another great feature of the e.l.f. Pore Refining Brush and Mask Tool is how well it also works with makeup. I tried it to spread out as well as blend in my foundation with good results. The rubber spatula had the perfect amount of bend for me to access areas like my nose and chin. And just like with a mask, the spatula rinsed clean in seconds with no trace of foundation, which left me with one less brush to clean on my brush cleaning days! You can also use it for mixing at home masks because it acts just like kitchen spatula.